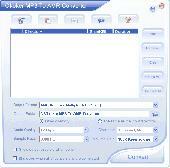 Mmf Mp3 Amr Wav RingTone Maker is an ringtone editor and converter. Allok MP3 to AMR Converter software is a powerful AMR Converter that lets you convert your audio files to and from the AMR format used by your cell phone. You can convert from WAV, MP3, OGG, WMA, AC3, AMR, 3GP, MP2, to AMR format. Allok MP3 to Amr Converter software is a powerful Amr Converter that lets you convert your audio files to and from the Amr format used by your cell phone. You can convert from Wav, MP3, OGG, WMA, AC3, Amr, 3GP, MP2, RM, RMVB, RAM, VCD, VOB, AVI, MPEG, WMV, ASF, etc. to Amr format quickly and easily. Abyssmedia Audio Converter Plus is a powerful, professional solution designed for converting the most popular audio formats and Audio CD tracks directly into MP3, WMA, OGG, AMR or WAV formats. Convert audio files between MP3, OGG, FLAC, APE, VOC, SHN, M4A/M4R/M4B, AMR, WAV, VOX, and other popular audio formats. Export and convert audio from video. Create ringtones and audio-books for iPhone. MIDIRenderer is a MIDI rendering software that allows you to convert MIDI to MP3, WMA, OGG, FLAC, APE, AMR or WAV files. It is often used when you need to playback MIDI composition on the portable player, car audio or burn MIDI files on CD. MP3 To Ringtone Gold is a ringtone converter. It can be used to convert mp3, wma, amr, wav, ogg and CD to ringtone format (m4r,mmf, amr, mp3, wav, qcp). You can send them to your cell phone with our online ringtone sender or transfer them to your iph. Aoork DVDRipper Pro is a professional DVD ripping and backup tool, which can help you easily and rapidly rip DVD to rm/rmvb/wmv/AVI/MP4/3GP/MOV/ASF/FLV/MPG/MP3/WMA/RA/AAC/AC2/OGG/MP2/AMR/WAV files with the perfect output quality. Aoork DVDRipper Home is a straightforward DVD ripping tool, which offers an quick and simple method to rip dvd to rm/rmvb/wmv/AVI/MP4/3GP/MOV/ASF/FLV/MPG/MP3/WMA/RA/AAC/AC2/OGG/MP2/AMR/WAV files. Media Convert Master is a professional video converter, you can convert your video and audio files from one format to another. It supports multiform convert formats including AVI, MP4, 3GP, MPEG, MOV, WMV, RM, SWF, AAC, AC3, MP2, MP3, AMR, WAV, VOB and ASF. It is extremely professional converting software with fast conversion speed and high quality. With OneClick Video Converter you can convert almost all video and audio formats, such as 3GP, WMV, RM, MP4, MPEG, SWF, AVI, MOV, AAC, AC3, MP2, MP3, AMR, WAV, VOB and ASF with just a few clicks. Forewave Audio Converter is an universal audio converter, it provides you an easy way to convert between different audio formats including MP3, WMA, WAV, Real Media RA, FLAC, AAC, AC3, AMR, WAV etc. Forewave Audio Converter is an universal audio converter, it provides you an easy way to convert between different audio formats including MP3, WMA, Wav, Real Media RA, FLAC, AAC, AC3, Amr, Wav etc. It also supports Video-to-Audio conversion, you can import a video file in almost any popular formats and turn it into an audio file. Agood MP3 AMR OGG AAC M4A AC3 WAV Converter Free is versatile and powerful software which can help you convert all popular audio files to MP3,AAC,AC3,AMR,M4A,OGG,WAV.But it can only finish one file once It has easy-to-use and professional interface. Power AMR MP3 WAV WMA M4A AC3 Audio Converter is an audio conversion tool that allows you to convert various audio formats WAV, MP3, MP2, MP1, MPEG, MP4, M4A, AAC, OGG, AVI, MPC, MOV, QT, AIFF, AU, AC3, WMA or 3GP to WAV, MP3...etc. Power Amr MP3 Wav WMA M4A AC3 Audio Converter is an audio conversion tool that allows you to convert various audio formats Wav, MP3, MP2, MP1, MPEG, MP4, M4A, AAC, OGG, AVI, MPC, MOV, QT, AIFF, AU, AC3, WMA or 3GP to Wav, MP3, MP2, OGG, AC3, VOX, WMA or Amr format. Okoker MP3 to AMR Converter is a professional and powerful AMR Converter that lets you convert your audio files to and from the AMR format used by your cell phone. You can convert from WAV, Mp2, MP3, MP4, swf, OGG, WMA, AC3, AMR, 3GP, MPEG, WMV, etc. Convert MP3 to Ringtone is a powerful ringtone converter. This software can convert your favorite mp3, wav files and CD tracks(ringtone ripper) to ringtone format, including mmf, amr, mp3, midi, wav, aac, 3gp and mp4 ringtones. EZ Ringtone is a powerful ringtone converter. This software can convert your favorite mp3, wav files and CD tracks(ringtone ripper) to ringtone format, including mmf, amr, mp3, midi, wav, aac, 3gp and mp4 ringtones. Batch convert WAV, RM, RA, RMVB, M4A, AAC, AMR, AIF, AU, APE, FLAC, OGG, VQF, MP3, WMA, ASF to WMA, MP3, AAC, M4A, AMR, AWB, VQF, OGG, FLAC, APE, WAV formats. Other features include normalization and more. Convert all popular video formats to AMR, such as AVI, MPEG, WMV, MP4, FLV, MKV, H.264/MPEG-4, DivX, XviD, MOV, RM, RMVB, M4V, VOB, ASF, 3GP, 3G2, SWF, H.261, H.264, DV, DIF, MJPG, MJPEG, DVR-MS, NUT, QT, YUV, DAT, etc. Export high quality files. Convert AMR to almost all type audio formats; Download FLV from web and convert them to AMR; Remarkably easy to use for both beginners and professionals; Support over 250 video/audio formats; Fast conversion speed and high quality. Convert audio files to WAV and convert WAV to popular audio formats. You can convert between WAV and the following folrmats: MP3 AAC, WMA, CDA, FLAC, M4A, MID, MKA, MP2, MPA, MPC, APE, OFR, OGG, RA, WV, TTA, AC3, DTS. Agood All Audio Converter Ultimate Free features supporting versatile video and audio formats. Input AVI,WMV,MPEG,MP4,ASF,VOB,3GP,iPhone,MOV,FLV video files and MP3,AAC,AC3,AMR,M4A,OGG,WAV audio files to convert them to popular audio file. 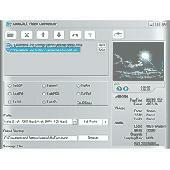 Cool Audio to AMR Converter is an all-in-one and professional AMR audio conversion software. With Cool Audio to AMR Converter, you can convert almost all media including AVI, WMV, MPEG, MP4, ASF, VOB, 3GP, iPhone, MOV and FLV video and MP3, AAC, AC3. 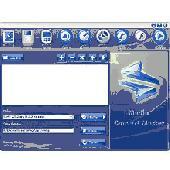 Cool Free Audio to AMR Converter is an all-in-one and professional AMR audio conversion software. With Cool Audio to AMR Converter, you can convert almost all media including AVI, WMV, MPEG, MP4, ASF, VOB, 3GP, iPhone, MOV and FLV video and MP3, AAC.